If you are looking for real-life guidance on how to make a profit using tipsters, then the 2 latest ‘Practical Punter’ Reports published today will be right up your street. Written by 2 different (yet ultimately profitable) semi-pro gamblers, both Practical Punter Reports explore everything from the sports they bet on to the exact make-up of their betting portfolio (namely the tipsters they follow!). After all, betting can also be a lonely game sometimes – and these reports are our way of trying to foster the most supporting ‘expert punter’ community possible here at SBC. The Practical Punter Reports were first introduced back in November 2013 last year as a way to highlight some of the very real practical implications of following a range of tipster services. Its one thing finding the best tipsters (which is where we come in) but there is simply no substitute to listening to those who have been there, bought the t-shirt and made cold hard profits. Currently, there are a total of 7 Practical Punter Reports available to SBC members and you can expect to read at least 1 new report each month. After a couple of weeks banging the drum for our bookie fairplay campaign in these columns, I am getting back to basics today with a focus on betting trends – including how one simple set of analysis helped boost the ROI punters can enjoy on one top tipster to as much as 15.4%! First of all though, a little education on what to watch out for when it comes to trends and avoiding being sucked in by something called the ‘Gamblers Fallacy’. To briefly explain using the coin toss analogy (a cliché I know but it’s easy to understand!) If I were to toss a coin 10 times and each time it were to come up heads, many people would automatically think the 11th time MUST be tails. This is the fallacy in action as the 11th coin toss is completely independent of the previous 10 and there remains a 50/50 chance that it will be either tails of heads. You can find a more detailed explanation of this courtesy of Kieran Ward’s post here. You Are Never ‘Due A Winner’! 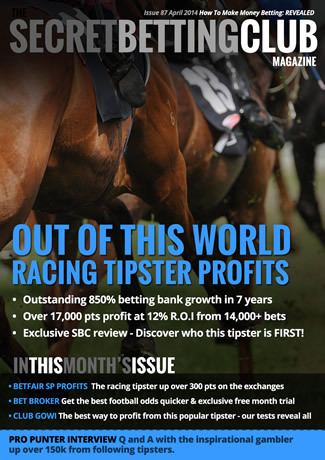 The very latest Smart Betting Club Magazine has just been released and this month it’s truly a bumper edition, packed to the rafters with expertise to help you make money betting. It contains independent reviews and analysis on a number of outstanding tipsters, an interview with a bonafide profitable punter and the lowdown on the bet broker software that can vastly improve your football betting. Today sees the start of our new ‘Bookmaker Fairplay’ campaign – where we are taking a stand against unfair modern day bookmaker practices. If, like many, you have suffered from closed bookmaker accounts or limited stakes on the bets you want to place, this campaign is designed to help you – both in order to raise awareness of this issue and to ultimately force change. 1. Bookmakers need to take a minimum stake bet of £20 on any bet they advertise either online or in print media from all punters. 2. Bookmakers to provide a clear warning to all new customers that they may have their accounts closed or limited in stakes if they are considered unprofitable. If you agree with this campaign, then you can get involved in a number of ways. First of all, be sure to sign our petition demanding Bookie Fairplay and the implementation of our 2 campaign proposals. As with all petitions, it is a simple numbers game and the more signatures on it, the greater the chance of people listening to this issue and forcing change. We will be lobbying both the Gambling Commission and the Association of British Bookmakers. You can also help push this campaign and share the petition link on twitter with the hashtag #bookiefairplay. You can also spread awareness through Facebook, by liking and sharing the Smart Betting Club Facebook page and links to our campaign. If you are planning on having a bet in the Grand National today, make sure you take advantage of the very special offer we have put together with Titanbet. Not only are they paying out on the first 6 home and refunding stakes on any fallers in the first 8 fences but they are also offering you the chance to win a year’s free SBC subscription! This offer is open to new and existing SBC members (you will simply get an extra year tagged on if already a member). 3. Wait for notification from Titanbet to see if you have won. This offer is only available for new Titanbet accounts only and will expire once the Grand National starts.